The MDHS Early Career Researcher (ECR) Network is hosting an end-of-year celebration! Join like-minded ECRs for a drink and chat on Thursday 7th December, from 5 pm at Tsubu Bar, The University of Melbourne, Parkville. FREE and open to all UoM ECRs; but please note that registration is required prior to the event for catering purposes. 1 drink (beer or house wine) per person and snack food will be provided. Don’t miss out – places limited! Registrations close December 1st at 4 pm. Registration extended. Closes 25th October. Have you ever wondered what goes on behind the scenes in a newsroom? Who decides what stories to cover and when? Where do science stories fit in? And how do you get your research in the news? We’ll bring together a panel of working journalists from print, TV, and radio to tell us about what they do, and what they look for in a story. The panel will give you an introduction to the needs and challenges of TV news, radio, and the daily press. Register: https://www.eventbrite.com.au/edit?eid=37987858708. Registration is FREE and closes 25th October 2017. MEDIA AND COMMUNICATION TRAINING WORKSHOP (2nd November)Need to talk about your research but unsure how? Join Science in Public for their one-day media and communication training workshop and get some help.Conveying the complexity of your research, your life’s work, into a 30-second grab for the media can be hard. The solution is to shape the essence of your science into a story.We will help you find the right words to explain your research in a way that works for the media, as well as for government, industry and other stakeholders. Two experienced science communicators will work with you to find the story in your research. Over the years we’ve helped Monash launch the world’s first printed jet engine, revealed the loss of half the coral on the Great Barrier Reef, helped CERN announce the Higgs boson, and revealed the link between CSIRO’s Wi-Fi patent and Aussie astronomy.Working journalists from television, print and radio will join us over the course of the day to explain what makes news for them. And you’ll get the chance to practice being interviewed in front of a camera and on tape.The day’s insights and training will help you feel more comfortable in dealing with journalists when media opportunities arise. You can read more about our courses at www.scienceinpublic.com.au/training. This course will be FREE (including lunch) to 12 selected MDHS ECRs/MCRs, and is an excellent opportunity as it normally comes at a cost of up to $2000 per person. Interested candidates for the workshop can submit an application including their CV (max 3 pages, 12pt) and a short answer to ‘How do you think the Communication in Science workshop with benefit you as an ECR/MCR?’ (max 150 words). Applications close 22nd October 2017. Submissions are to be emailed to MDHS-ECRnetwork@unimelb.edu.au. The MDHS ECR Network is proud to present an evening of opportunity. The “Alternative Careers in Science” event, chaired by Prof. Patrick Reading (Dept. of Microbiology & Immunology, and Senior Scientist and Educator at the WHO), will include presentations by 4 members of the scientific community who have taken less traditional career pathways after completing their studies. 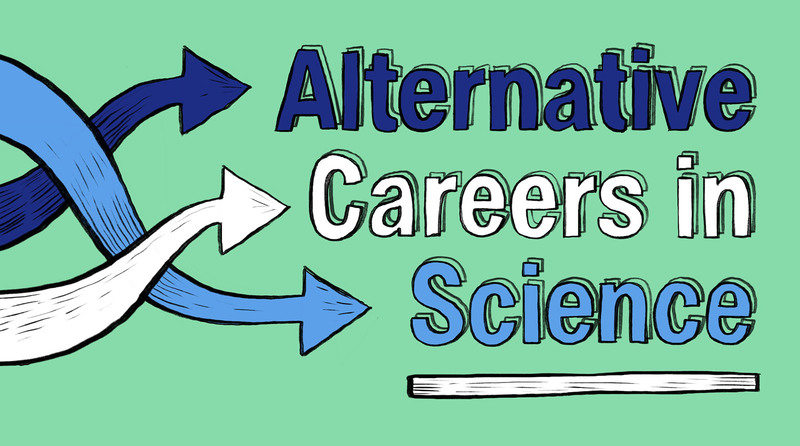 Come along and listen to inspiring stories about the types of careers that are available to STEM scientists, and have the opportunity to ask questions about how each of these scientists identified their niche and developed a successful career. Dario Buso holds a Chemical Engineering degree and a Ph.D. in Materials Science and Engineering, and has acquired extensive research experience in the field of advanced materials, polymers and nanotechnology for sustainable energy, sensing and photonics. Dario has been a post-doc researcher in Australia from 2008 until 2011 as the recipient of an Australian Research Council (ARC) fellowship, working at CSIRO in a joint project with Swinburne University of Technology. Since 2011 Dario has been working as a Patent and Trademarks Attorney within the Materials Science group at Davies Collison Cave, where he manages patent portfolios for clients that are active in the field of materials engineering, materials synthesis and industrial process development. Krystal Evans has an undergraduate degree in medicinal chemistry and holds a PhD in medical biology undertaken at the Walter and Eliza Hall Institute. Krystal led a malaria vaccine development program at the Walter and Eliza Hall Institute, which attracted funding from the Bill and Melinda Gates Foundation, the NHMRC and Commercialisation Australia. Krystal is a leading advocate for science and technology, and was a founding member and Chair of the Australian Academy of Science’s Early and Mid Career Researcher Forum. A champion of the 2011 “Discoveries Need Dollars” campaign, she led the Melbourne “Rally for Research” to protect funding for medical research in Australia. Krystal was appointed Chief Executive Officer of the BioMelbourne Network in July 2014 and has over 15 years experience in the biomedical research sector. Krystal’s skills in government affairs, stakeholder relations and business development underpin her commitment to advancing Victoria’s unique position as a global destination for life sciences and health technology. Katherine Jackman holds a Bachelor of Science (Hons) and PhD in Pharmacology from the University of Melbourne. Katherine completed her postdoctoral training at Weill Cornell Medicine in New York on an NHMRC CJ Martin Fellowship, then came back to the Florey Neuroscience Institute and is now an investment analyst at Brandon Capital Partners. Please share this event with your department, institute and colleagues. See flyer here. Two of our committee members, Dr. David Gonsalvez, Ph.D. and Dr. Jaclyn Pearson Ph.D., were selected to attend the Early and Mid-Career Researcher Forum annual conference in Sydney in September 2016. Below are personal accounts of their experiences. Back Story: Simon started of as a businessman who has served as the chairman of Macquarie Group, AMP and CSIRO. In addition to his role as chancellor of Monash University, he holds current position as the Chairman of In2Science, the Group of Eight’s Industry and Innovation Program. Main focus: Despite being the chairman of so many institutions, the main focus of Simon’s talk was to tell his story of how he as part of a team (including engineers and sailing enthusiasts), managed to design, build and pilot the first sail boat to crack the 50 knot mark. For innovation to really occur, you must be willing to be a little bold, and you must be willing to get into the drivers seat. The Chewen Keynote: Professor Emma Johnston (UNSW Australia). Back Story: Despite being profssor, and one of the most eminent researchers of marine ecology and ecotoxicology Emma, is an exemplar science communicator and television presenter. Main Focus: Leadership in science, science communication and the need to engage the public and take on public office. Leadership is something that scientists just simply cannot overlook; some scientists think that investing their own leadership development is a waste of time. Emma strongly disagrees (as do I). Being a leader in does not simply mean you publish in the best journals, or that you are the most successful at getting grants it goes far beyond this. In order for science to be come more prominent in the Australian political agenda scientists have to bring about change, currently <10% of our politicians have a STEM qualification! Why is politics a no-option, in terms of a career path for people with a PhD??? You have to put yourself out there, and prepared to accept the fact that for change to occur (either for yourself or more broadly) you need to be willing to put the hard yards in, despite knowing that there is potentially little short term personal return. Scientists taking on leadership, with respect to public engagement must be valued more strongly. Only with public awareness, comes public debate, comes political interest… The public’s perception of the value of science is up to us to create and currently we are not focused enough in this regard (comment relating to a question asked). Funding longevity (or a lack there of), in most cases the term of employment contracts makes it difficult to focus on long-term leadership goals. There is very limited acknowledgement for demonstrating leadership in most of the Major Universities KPI’s, however some of the private institutes i.e. CSIRO did have leadership as a focus in terms of promotion. Start small (lab based initiatives like student evaluations and mentoring) then get bigger. Be the leader you want to see, have the courage to hold your ground when it counts, develop listening and communication skills, and even formally invest in up-skilling. Be aware of problems and address them ASAP, don’t avoid having the difficult conversations, listen then talk to people, always keep a clear communication line open and try to mitigate forcible problems early. You need to be resilient and have some self belief, all of the panel members emphasised how they had been rejected many times, it’s a matter of having the guts to stick it out sometimes, this can be the hardest part of leadership. When you take people down a path, don’t expect it to be smooth sailing. If we want to improve government engagement with science, then we have to consider refraining from simply banging on the door asking for more funding, instead, we should look to see how we can assist government in improving their operation, or help them to better achieve some of their targets. If we do this, Government will look more favourably at funding science going forward. Like it or not, there is a current government objective for academic researchers to be more engaged with commercial partners. Think about how to communicate your science to the general public. Public opinion and perception can significantly impact decision-making processes, regarding how resources should be allocated to science. This was a panel discussion with the following panellists (Douglas MacFarlane, Julie Cairney and Susan Pond). Each speaker gave a quick talk about their view on balancing management and leadership. Empower you staff and colleagues, try and take them with you, perhaps even allow your self to be lead, this might be a way for you to expand your research and foster leadership development within your team! This was a series of presentations followed by a short a panel discussion with the following panellists (Robyn Williams, Associate Prof Darren Curnoe, Rick Baker, Dr Esther Levy, Dr Thomas Barlow). This section is covered very well in the official conference summary however I have added some additional points. Make your communication simple clear and demonstrate enthusiasm for your work. Dr Jaclyn Pearson, NHMRC Peter Doherty Early Career Research Fellow, Department of Microbiology and Immunology. “The EMCR Forum is a network run out of the Australian Academy of Science that supports and promotes the career development of early – mid career researchers who are up to 15 years post-PhD. They engage with the NHMRC, ARC, local and national government and industry to help identify and promote career and funding opportunities for EMCRs. Importantly, the Forum has a strong focus on gender equity and diversity. This 2-day conference was focused on identifying and understanding how to promote pathways to leadership, an area that many EMCR members had flagged as an important area in which they required help/advice. The program centred around a range of diverse speakers including the renowned Simon McKeon AO (Monash University) and Robyn Williams AM (ABC Radio). These talks were followed by panel discussions with plenty of time for questions and discussion from the audience. In between the speaker’s sessions there were breakout workshops which aimed to focus our thoughts on key questions around leadership and strategies towards becoming a strong and effective leader, as well as the obstacles that we face in trying to achieve this. All of the discussion points were collated on the final day and delivered back to attendees in a report distributed by the EMCR Forum committee. I would like to list the inspirational, helpful and take-home points from the speakers that really stood out to me. A summary of all speaker’s talks and of discussion group outcomes can be found in the EMCR full conference Report. Leadership skills can be developed in diverse areas, in and out of science. Take opportunities wherever you can, create new visions, take the step of deviating form the plan, take the risk and make new plans! Ask the question: ‘who am I going to work for and what are they doing for me?’ but also ask ‘what can I do for others’. Think about growth areas in Australia: small companies working with scientists, NOT large firms. Recruit people who will challenge you, those not afraid to make mistakes. Get your team to understand the END GOAL of your research, develop a culture. Learn how to pitch your research in 3-4 minutes. Describe the world of your research did not exist, how is it benefitting the wider community? Use surprise: counterintuitive information (facts that other people don’t know), this build attention and curiosity. Strive for simplicity, use proverbs, stories, metaphors. Get to know yourself: Be alert to your team and your own behaviour – do you talk too much? Not listen enough? Qualities of a good leader: 1) TRUST!!!! 2) Actively recruit people who are good at what they do, you can’t be good at everything. Record yourself in an interview with a friend, see how long 3 mins is, see how you sound. Show enthusiasm without going over the top. Get a WordPress account and just write! Guiding principles: understanding (of stakeholders e.g. media, knowledgeable on subject), be detached (facts not people), be passionate (let it show), be genuine (always be honest), quality (of writing and speaking). In addition, there was a social evening which was essentially a workshop in itself – probably one of the most enjoyable and beneficial social events I have attended for such an event. Whilst having drinks and food the organisers placed us in groups of ~8 people. We had to nominate an ‘actor’ or ‘speaker’ who would deliver a speech to the whole audience on why they were such a great leader (all sarcasm) – full of self importance and everything being about themselves. This was supposed to identify what being a ‘bad leader’ looked like but with humour added. We took all of our knowledge from the talks and workshops on what a good leader should be and just flipped it on it’s head – a fun and insightful way to exaggerate the points of effective and ineffective leaders. Are you an ECR planning to submit a grant or fellowship application in the 2017 funding round? Are you looking for tips on making your application more competitive? If so, this Perfect Pitch event hosted by the MDHS ECR Network is just for you. Several speakers who have recently sat on fellowship and grant panels will present information about how the review process works, what reviewers are looking for and strategies ECRs can employ to prepare a comprehensive and competitive application. Session 1 of the program is open to PhD students and post-doctoral ECRs from the Faculty of MDHS. 4:00 – 4:30 pm: This session will begin with ECRs being paired with another ECR working in a different field. The partners will exchange the first page of their fellowship or grant application for review by each other. For effective use of time, this first page must be prepared prior to attending the event. ECRs will be given 30 minutes to read the applications. 4:30-6:00 pm: Partners will provide feedback to each other on their applications. ECRs will also be given the opportunity to network with other ECRs. Session 2 of the program is open to post-doctoral ECRs only from the Faculty of MDHS. Light refreshments will be provided during Session 2.
Who: FREE and open to all MDHS PhD students (Session 1 only) and post-doctoral ECRs; but please note that registration is required prior to the event for catering purposes. Those registering for Session 2 must prepare the first page of their application in advance. Register here. Registrations close Monday January 16th at 4 pm. What: The MDHS Early Career Researcher (ECR) Network is hosting an end-of-year celebration! Come and join like-minded ECRs for a drink and chat. 2 drinks (beer or house wine) per person and snack food will be provided. When: Wednesday 14th December, 5 – 8 pm. Where: Tsubu Bar, The University of Melbourne, Parkville. Who: FREE and open to all UoM ECRs; but please note that registration is required prior to the event for catering purposes. Places are limited so don’t miss out. Register here. Registrations close December 9th at 4 pm. New – the ECR Writer’s Room! You asked for it – so we’ve organised it! Do you need dedicated writing time for that paper, grant or editorial? Join us for a monthly at “The ECR writer’s room”. We will write using the Pomodoro method (4 x 25 minute sessions) over 2 hours. Bring coffee, tea, snacks and commence writing! It’s time for the 2016 Symposium! After the success of the 2015 Inaugural MDHS ECR Network Symposium, the ECR Network has organised another symposium this year for researchers to network and showcase their research with the opportunity to win the $1500 best oral presentation prize, or one of the many other prizes available. The theme for the symposium this year is ‘collaboration,’ and features Professor Leann Tilley as the plenary speaker. The scientific program will include oral and poster presentations by MDHS ECRs (see below) and a lunch time panel discussion by mid-career researchers on collaborative research. The event will conclude with the opportunity to network with fellow ECRs whilst enjoying some light refreshments and an award ceremony. For more information, see the 2016 Symposium page. Come gather with your fellow ECR’s for some good food, craft cider (as well as the other usual suspects) and an action-packed night of Trivia. What: Dinner followed by trivia hosted by Seb Dworkin (Trivia Buffs). Come solo and join up with new friends on the night, or bring a team of 5. Prizes to be won! Where: The Cider House, 386 Brunswick St, Fitzroy. Enjoy tasty food and a stellar bar list! When: Thursday July 28th. Dinner at 6:30 pm sharp (doors open at 6 pm). Trivia begins at 7:30 pm! Who: All Early Career Researchers in the MDHS Faculty are welcome. How much: $10 entry (cash at the door); includes dinner and trivia. Choose from 4 delicious meals including vegetarian, gluten-free and lactose-free options. HAPPY HOUR drink prices all night! Limited places – register now! Announcing the new MDHS ECR Network Committee for 2016-2017! General members: Jess Fletcher, Jac Pearson, Claudia Marck, Angela Pizzolla, Amy Chung, Michelle Peate, Kevin Lau, Bao Nguyen, Alice Hucker, David Gonsalvez and Nicole Hill. A huge thank you to the outgoing committee, especially co-chairs Scott Kolbe, for the tremendous job they’ve done over the last year. If you would like to get involved this year, it not too late! Please contact the Network Committee at mdhs.ecr.network@gmail.com. There will be plenty of opportunities to help out with events over the coming year.